I don’t know about you, dear readers, but the EU referendum, the run-up to it and the aftermath, has made me feel quite jaded (understatement). Reading about it, thinking about it, reading all the propaganda and spin and accusations and misinformation. Also, I’ve been busy with other things. (Sometimes I get paid for writing, which is nice.) 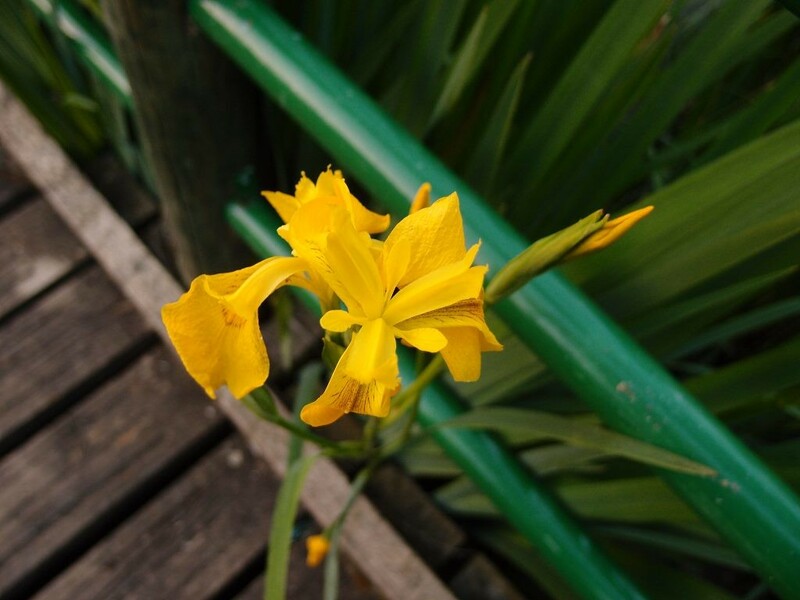 So after a tiring week, all I could think of, after much thought, was to focus on photos taken in this lovely month of June, here in York, photos that will I hope fill you with good cheer. Or at least give some distraction from Twitter etc, if you’ve been getting sad reading social media, as I have. 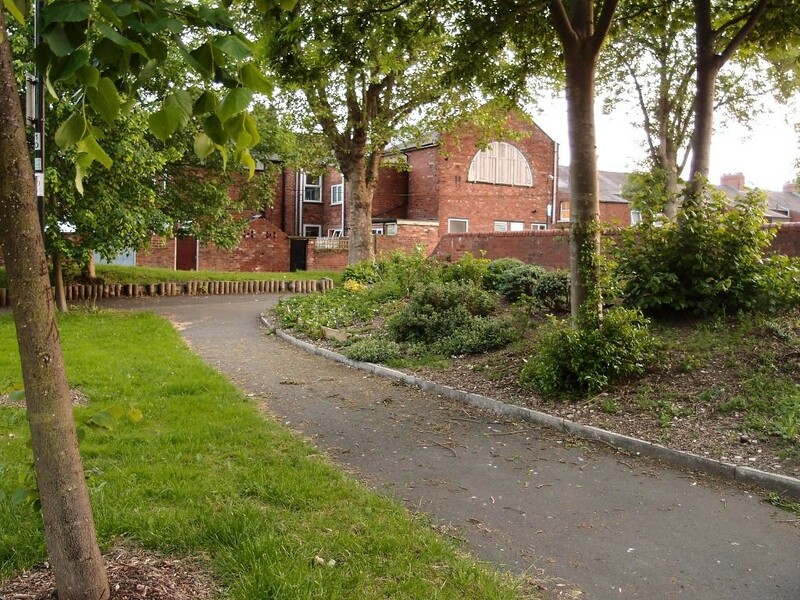 Millennium Green, between Water End and the Leeman Road area. 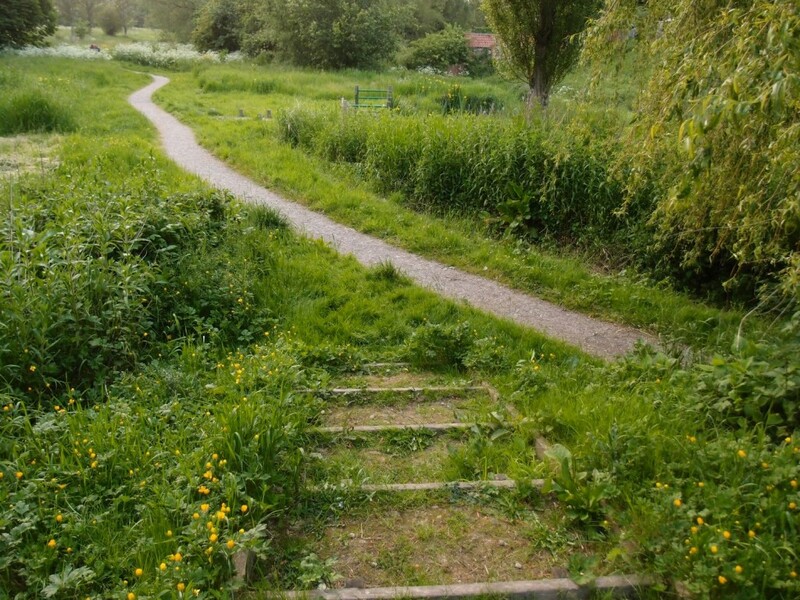 An area reclaimed and enhanced by the efforts of the local community, and supported by funds from the National Lottery, a sign at the entrance tells us. 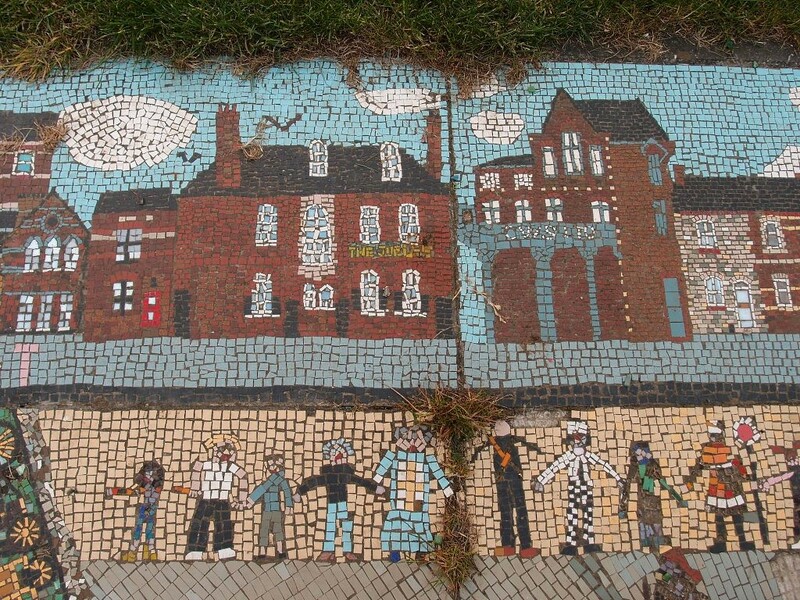 The Millennium Green includes this mosaic, looking a bit worn now, but showing the buildings of the Leeman Road area, and local features and wildlife, and a line of people, representing the local community. They seem to be holding hands. 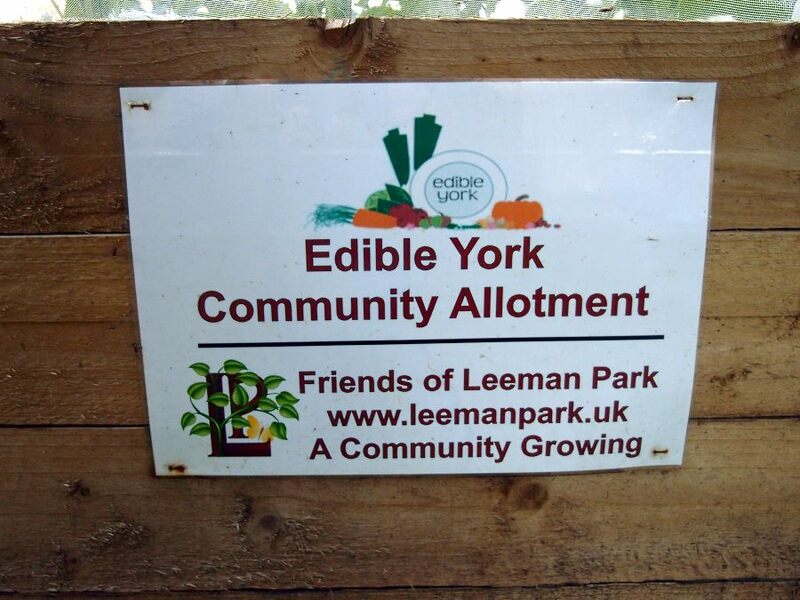 And not far away, in the middle of the housing, a park containing one of the Edible York schemes, veg beds for everyone to tend and harvest. ‘A Community Growing’, the sign says. 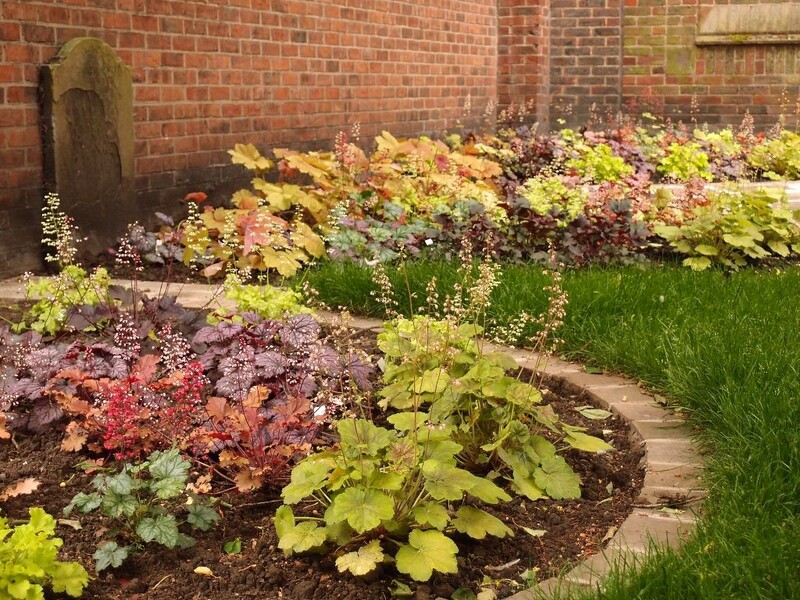 In the centre of town, off High Ousegate, an enhancement of part of the old churchyard of All Saints, Pavement. It was a bit of a nothingness before. 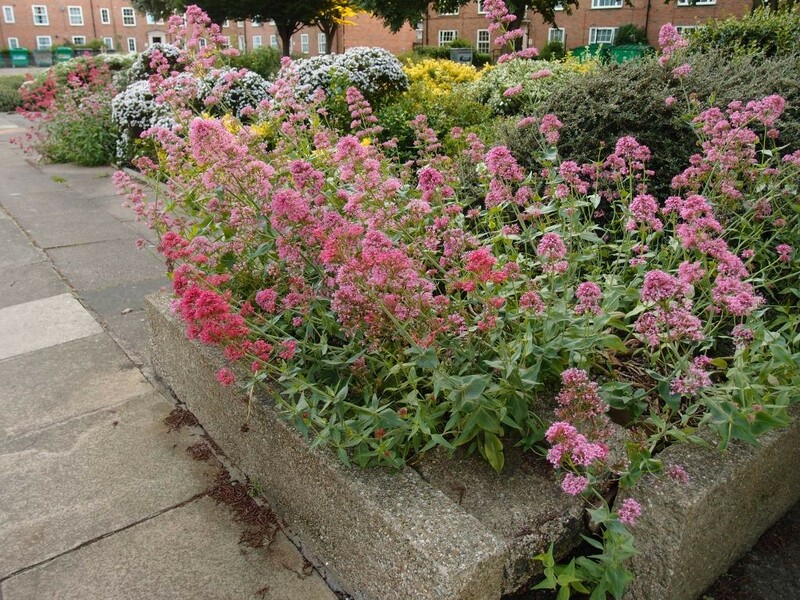 It how has flowerbeds with cheerier planting, thanks to the efforts of several parties, including City of York Council and the church, led by York Civic Trust as part of their ‘Pocket Parks’ scheme. And some benches, including one from the Feoffees. A lovely word, and one we don’t get much chance to use. Apparently pronounced ‘Feefees’. 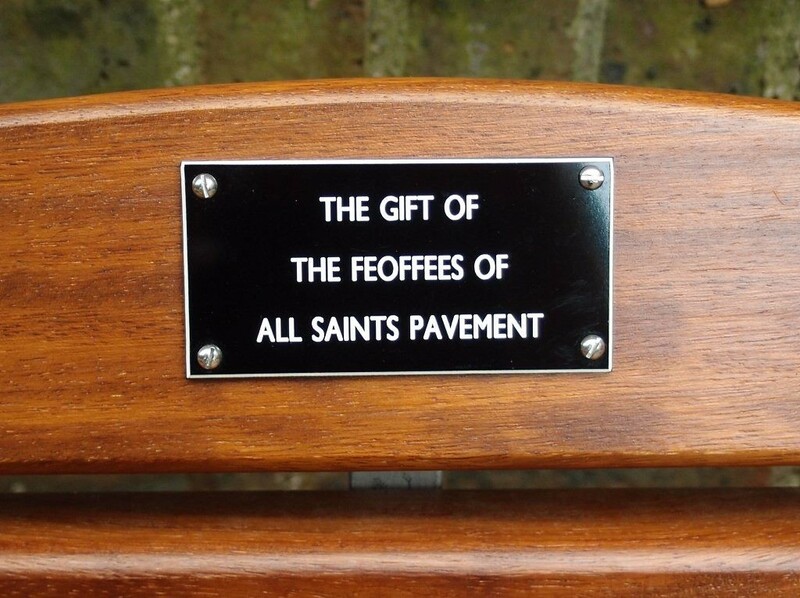 The fact that something with that name still exists, and donates benches, cheers me up. Over to an area just inside the city walls, by the Red Tower, to a garden area behind Rosemary Place and Navigation Road. Looking splendid as the sun went down, on the summer solstice. 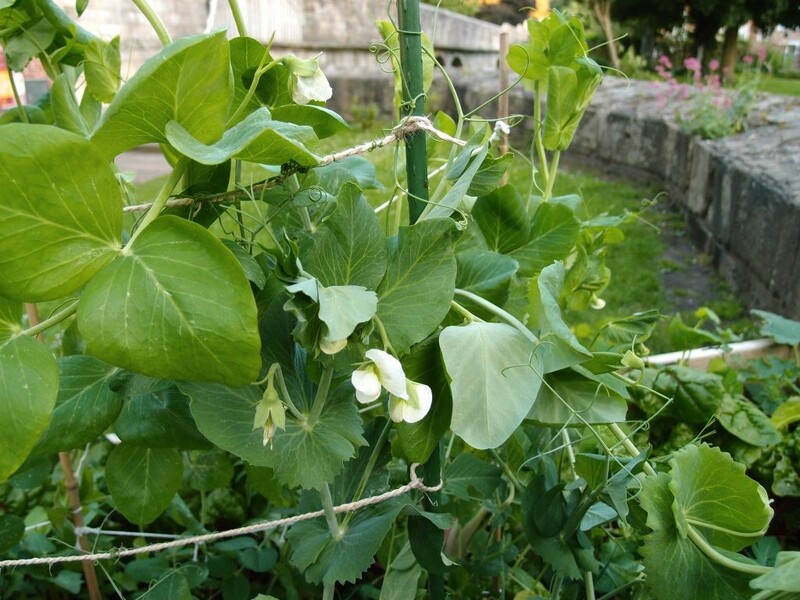 With another community veg bed close by, next to the Red Tower, with the walls walk stretching off into the distance behind it. 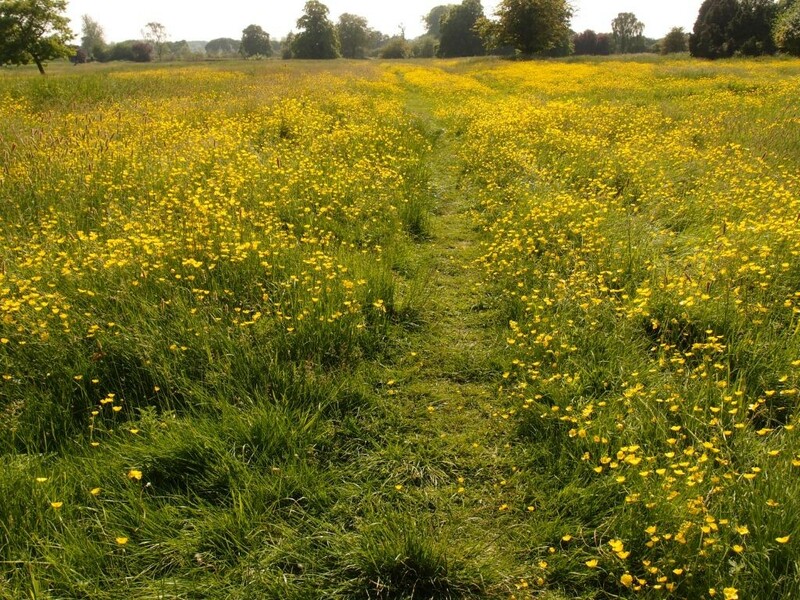 And at Clifton Park (grounds of the old Clifton Hospital), where they grow over old ridge and furrow land (centuries old, seen it all, this land has). 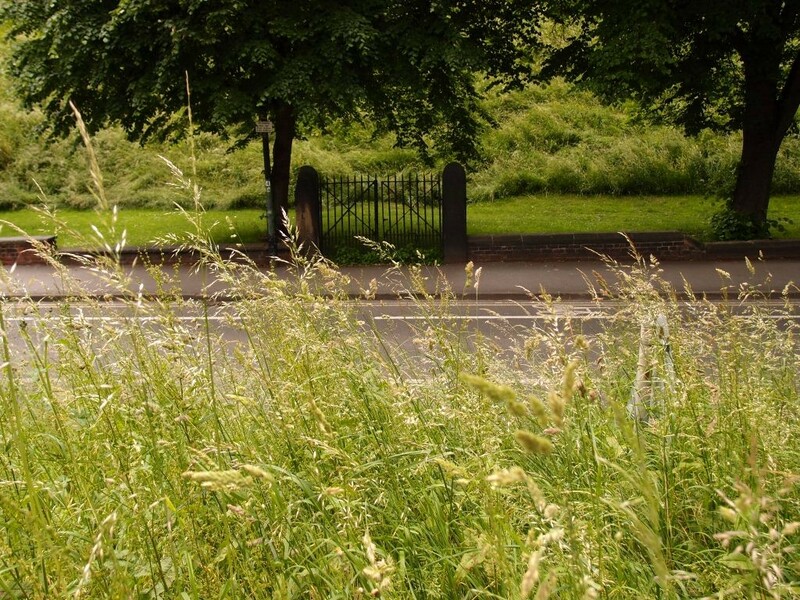 Back in the city centre, just outside the walls at Bishopgate Street, mown grass at the foot of the city walls and wild unmown grass in the foreground. Each complementing the other. Both pleasing, in their different ways. 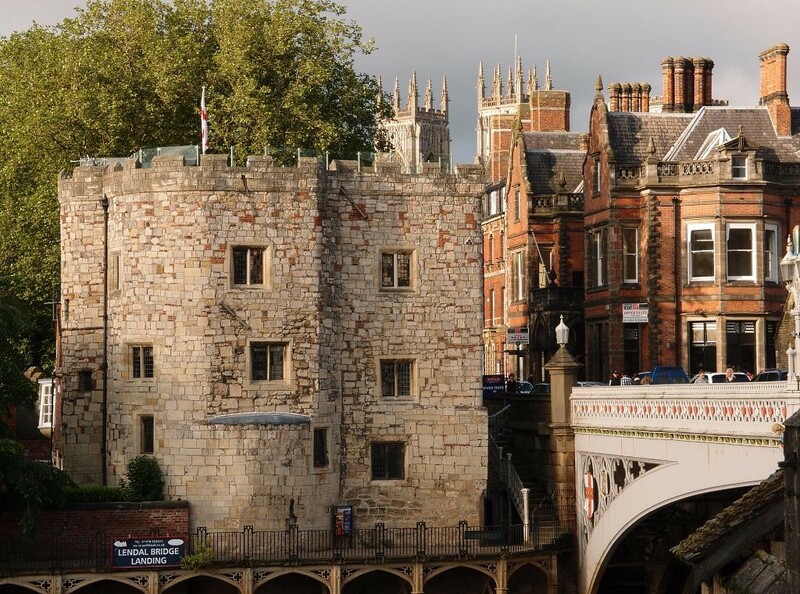 On that same walk, a little earlier, I’d been on the walls and passed through Micklegate Bar. So often photographed from outside. Here we are inside, looking out. Looking out, with a pleasing frame provided by the doorway, to light beyond. Light beyond, and steps. A little kink in the wall, on the way. Some of us might fancy the look of that, some of us might prefer to visit the visitor attraction here in the bar. 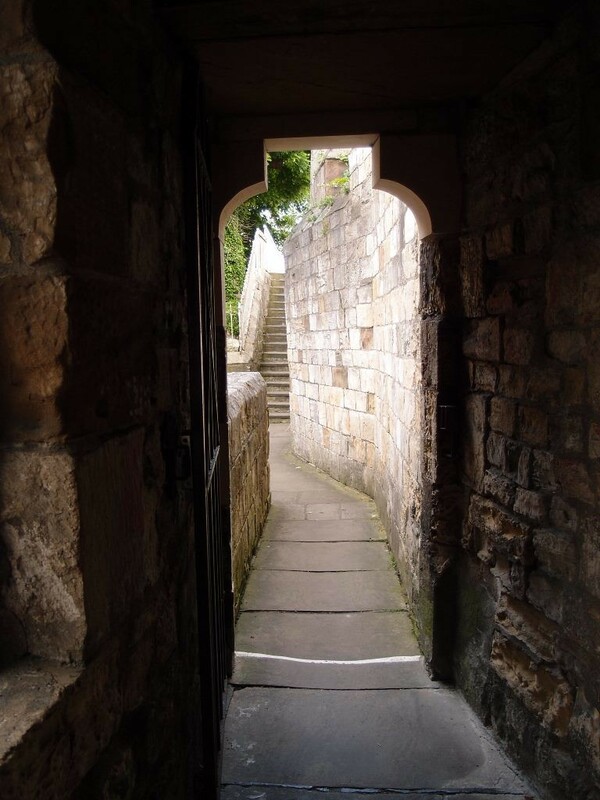 Or we could go down the steps to Micklegate, where there’s a plaque just outside the bar reminding us of civil war in the 17th century, how neighbour turned against neighbour. Here in the 21st century I’m hoping we make more gardens together, rather than feeling we need to build more walls. 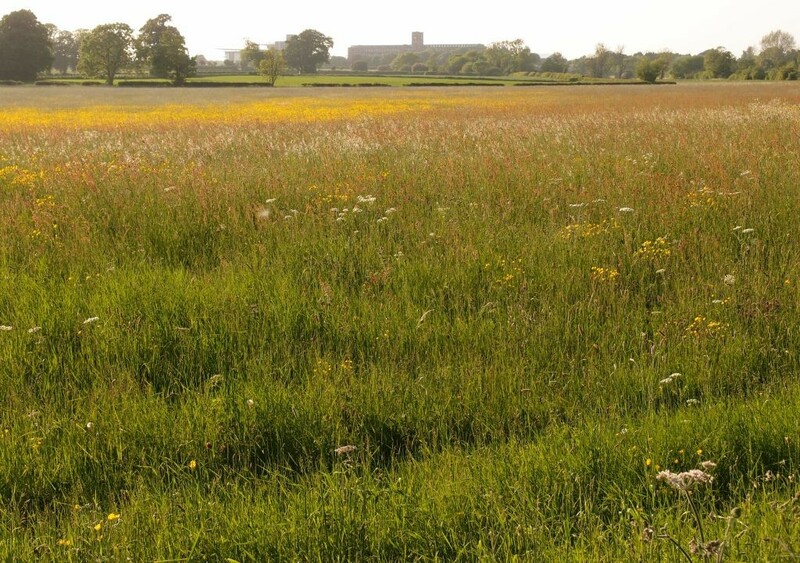 By Lisa @YorkStories • 26 June 2016 Details, Miscellany To link to this page's proper location please use the > permalink. A welcome change from all the gloom. Thanks, Lisa.